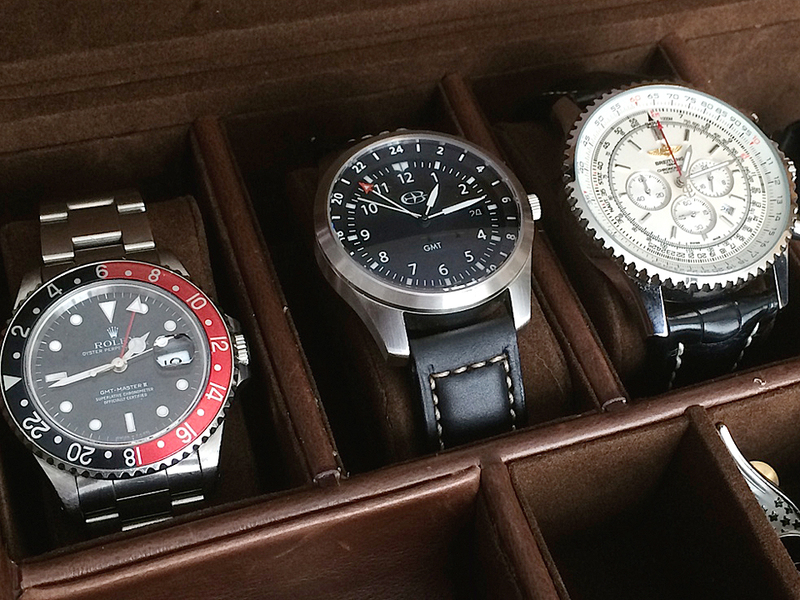 This is the confession of a Casio Watch nerd and Butler GMT Watch convert. 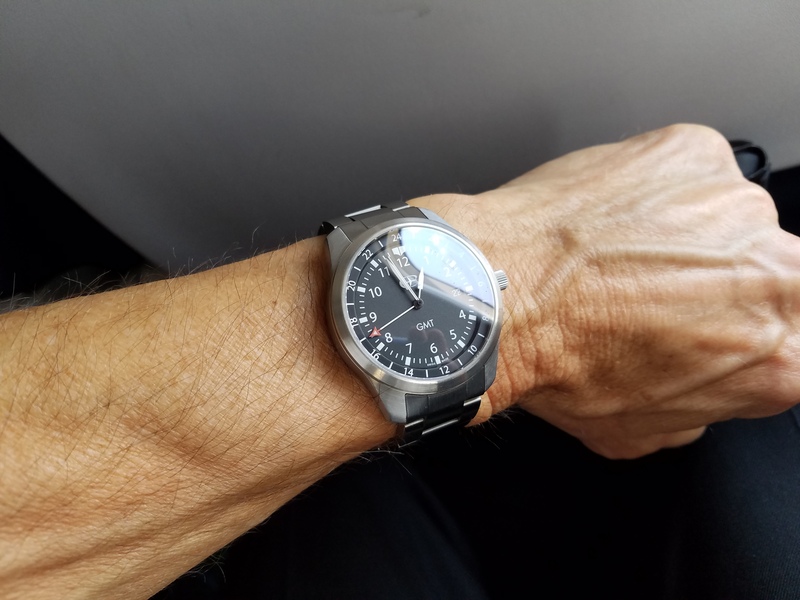 Until recently I was a Boeing 767 Captain, flying to destinations all over the world with a watch that only a fifth-grader might think is cool and no one would ever consider stylish. My new Butler Watch Company GMT watch with black leather strap, however, is a classic, age-appropriate time piece. The extra GMT (Greenwich Mean Time in London) or “Zulu Time” pointer is helpful every time I begin reading and evaluating a Flight Release packet, as all departure/arrival times, weather reports and forecasts, and Notices to Airmen “NOTAMS” use GMT. It is also most certainly cool and stylish. 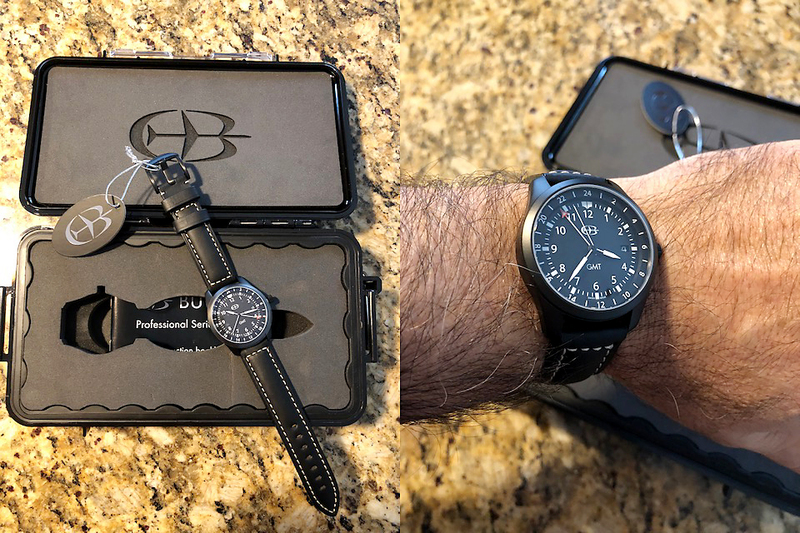 The watch arrived perfectly packaged in a unique Pelican case and was accompanied by an easy-to-read user manual, Certificate of Authenticity, Butler Watch Company logo stickers, a microfiber towel for cleaning, and an airline pilot ID holder. No detail was overlooked and the purchase, from website to delivery, was quick and easy. I could not be more pleased with Butler’s design, build quality and customer service. Having been a professional pilot for more than 30 years, I finally look like one! Many thanks. Dear Mr. Butler, I started flying lessons last spring. I have been an aviation enthusiast since I was a kid and am glad that even a little bit late in life, circumstances have afforded me the opportunity to learn to fly. 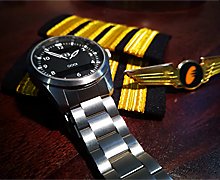 Not long after starting lessons I realized I needed a proper pilot’s watch. For me that meant it had to tell time (local and UTC,) and indicate the date. There was little else I felt I needed and much else I did not want. 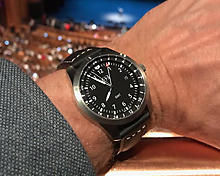 I had been looking for the better part of 8 months for the ideal watch before finding the Butler GMT watch which, if I had to start from scratch, is the watch I would have manufactured for myself. It is perfect in every way. A functional good looking time piece that does not require me to adjust my weight balance calculations just so that I can wear it. Thank you for producing a product that exemplifies simplicity, craftsmanship and value. 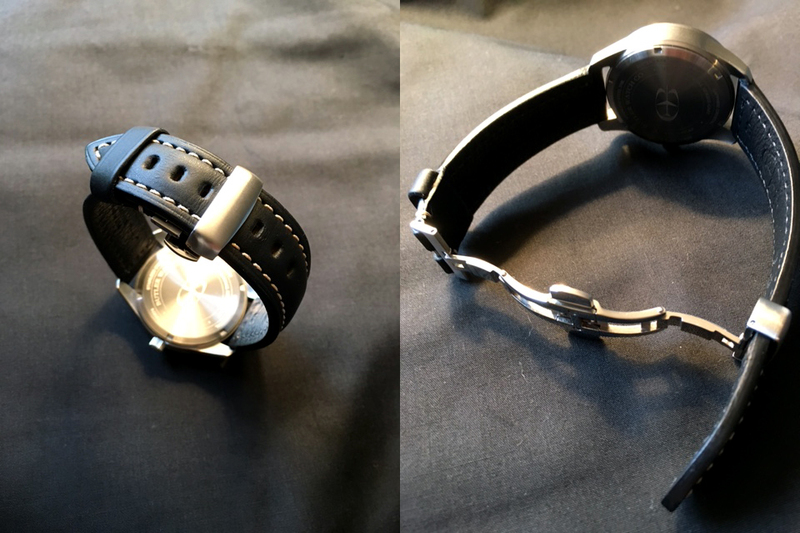 Hi Corey, I received my OOOI watch as promised, and was quite impressed! Had a jeweler size the band properly, and have hardly taken it off since! A high quality time piece, that is functional and stylish. Just what I need for flying across the world in the new fancy jet! All the best! Hi Corey, Just wanted to write and thank you for getting my new Butler GMT to me so quickly. It is awesome to wear and I am enjoying it a lot. Compared to my Omega Seamaster 600M GMT, it is so much easier to read and decipher the 24 hour hand because of its clean, clear face design. 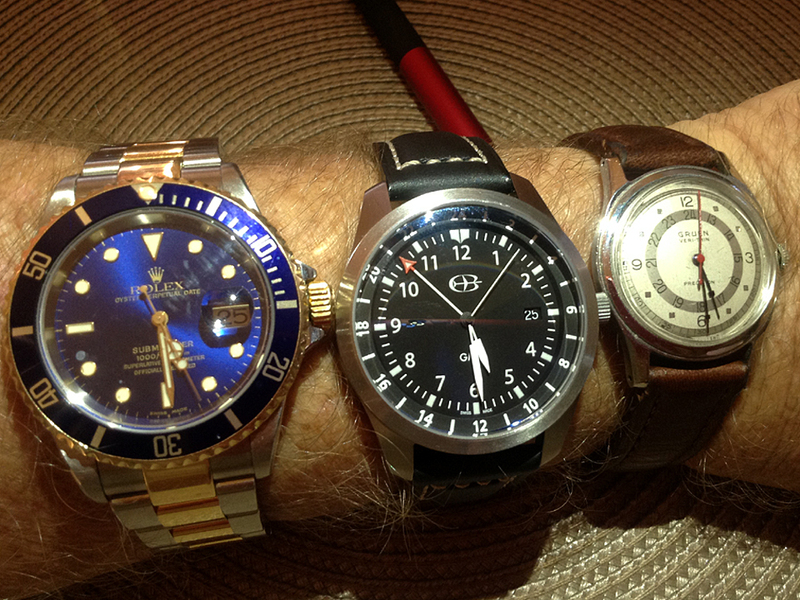 I became interested in nice watches and 24 hour/GMT/Zulu time a while ago. I like Omega watches, but also like other unique timepieces that show GMT time and multiple time zones. My daughter is studying abroad in Paris this semester so that helped me get into it, too. As an IT guy, some reports also come to me in GMT time. I've been using your Time Flies app on my iPhone to set my automatic watches and see multiple time formats. When I sent an email with a question about a setting in the app, you replied right away and sent a link to your watches with a discount code for Time Flies app subscribers. I did not know that is what was behind the app, so I took a look and immediately ordered the GMT version. Very nice watch, clean and clear face, thick leather band, and quartz accuracy which also keeps the price down compared to automatics. Great warranty and lifetime battery changes, too. I found you to be such a nice, standup guy, writing back to ask if I was a pilot or what drew me to your watches. We had a nice email exchange and the more I learned about you and your company and pilot-related activities, the more I appreciated your products. You made me feel like a valued member of your pilot community. I have no skin in the game at all, but when I see a good American designed and sold product (made in Switzerland so it is a fine Swiss watch, leather band made in USA) and a nice person behind it, I thought it was worth writing to let you, your customers, and potential customers know about my great experience. Can't wait to add another Butler to my collection. Hello Mr. Butler, I just received my GMT. I must tell you that I am very impressed. What a great looking time piece. Very professional. It feels great on the wrist. The dial legibility is stunning. Great finish. Thank you for making this nice product and I wish you all the best with your company. I thought you'd like to know that the new band is holding up well, even on several trips through CLT (whence the picture - DH), where I encountered the problem last. It performed admirably this morning when I got a very short short call, and has performed yeoman service through many self-induced scrambles to get to DTW on time. I have never sensed pleasure looking at a watch as much as I do now wearing the one you designed. 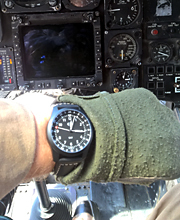 No disrespect to the old-Timex! Sir, I thought I would share with you that this is a great watch! Thanks again. I have attached a photo that I took before start up yesterday. Since receiving my watch, I have been extremely pleased with it's accuracy and appearance! Thanks for designing a watch that is as pleasing to the eye, as it is to the pocketbook! I believe my watch is an incredible value, and look forward to many years of it's use. A proud owner. I just got my PRO GMT watch and I absolutely love it! The size is perfect for my wrist, the thickness of the watch and the high quality leather is remarkable. I love the curve crystal, the highly readable face that a pilot can appreciate, and above all the GMT complication. The box and presentation is a nice touch. And the case back engraving is a beautiful, classy, intimate feature selfishly shared by the owner only. Your customer service & promptness was a pleasure to work with; aviation brothers! Looking forward to finally wearing this watch! One of a kind! I wore my new Butler GMT on my recent three day trip. I am pleased to say it passed with flying colors. I received two compliments on it. After three days it lost only one second as set by and compared to the US official time clock. I used it exclusively without referencing my iPhone once and always felt in control of my time management. I used my GMT function (instead of the onboard clocks) for my calculations and they worked perfectly. It has the right look in terms of complexity without being too busy. After working and living with it for three days I can only offer that I wish it had better “glow in the dark” viewing. 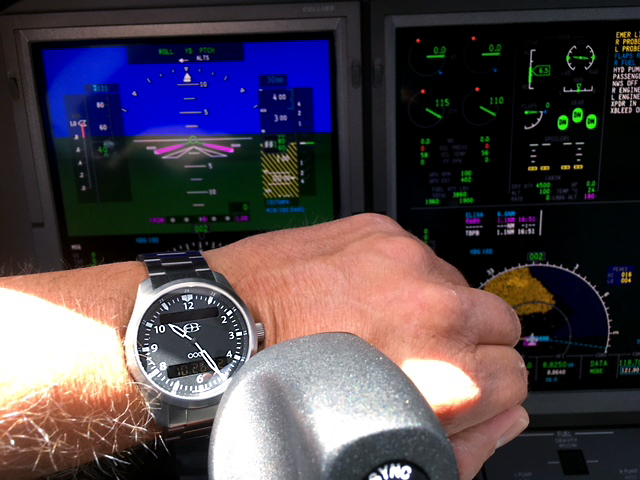 You know, I just realized that after the watch had absorbed more light through today, (the first part of my three day was night flying) the glow in the dark feature really stood out. Well done. I had no idea or preconceived notion of your watch before I received it. After wearing it, I was more impressed with the watch than when I was looking it over and studying it. With that in mind I realized that your watch is a “to know it is to love it” item. That is you must wear it to truly appreciate it. I feel you could offer a money back satisfaction guarantee with this watch in that I would certainly not return it now if I had that offer. The watch is gorgeous! 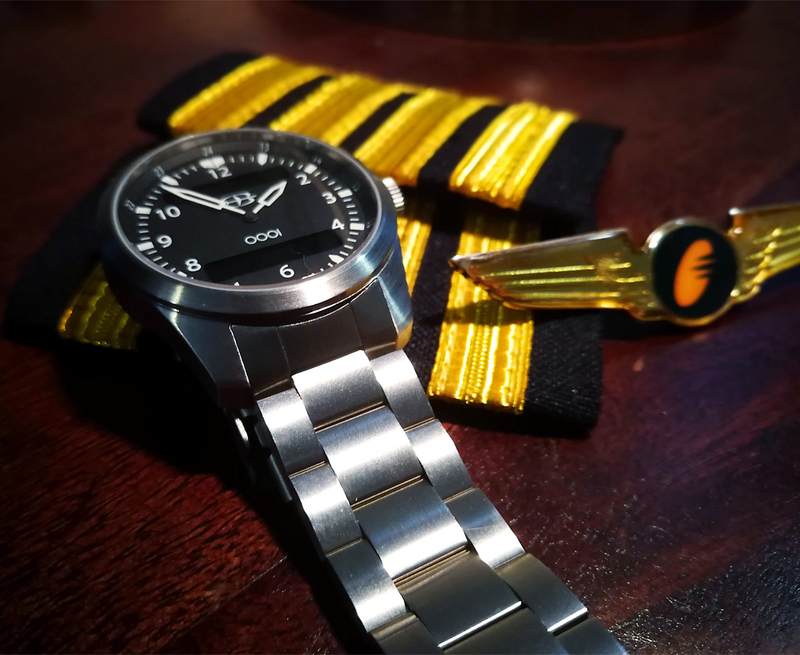 A true pilot’s watch. 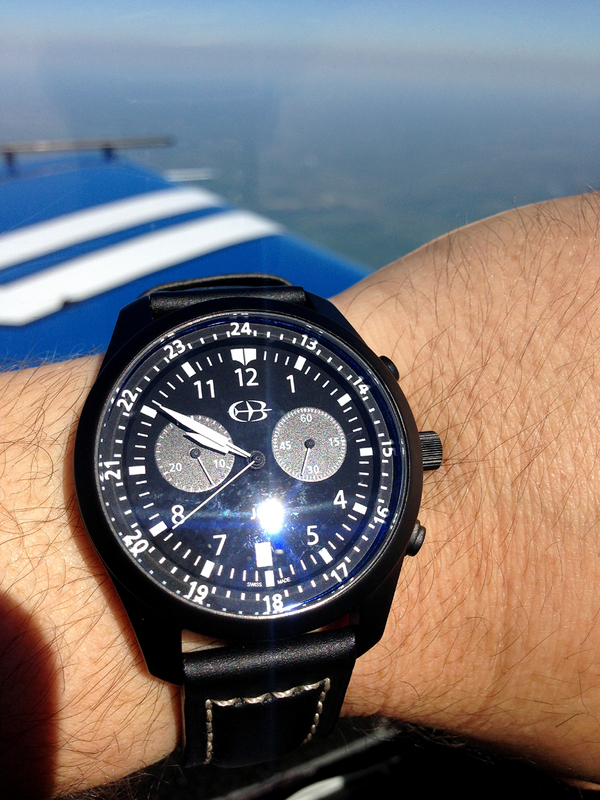 A pilot doesn’t need E6B on the face of his watch! Got my watch in the mail today, it is awesome. The detail throughout the entire piece is amazing. The pelican case presentation is a unique touch as well. Thanks for doing good work! "Happy 20th Anniversary, Love Jules"
I was so touched by my wife’s gift to me. And, I was blown away by the whole presentation of the watch. These watches arrive in their own special “Pelican Case.” Butler Watch didn’t miss any details! Even the foam on the inside of the case has the Butler logo in it. If they care that much about the packaging, you can rest assured they paid attention to every detail of the watch, itself. I have owned it now for 4 months and am happy with it today, as I was the day I received it as an anniversary present. The watch has not lost even a second since when I synched it to the atomic clock on the day I got it. I cannot say the same for my Rolex GMT Master II. In fact, I prefer the Butler watch over my Rolex. Many thanks to Mr. Butler for making this watch available to the public. I’m sure the road to getting watches on the market was not easy. I’m glad he made the effort, as the finished product is awesome. Just received my watch today. Couldn't be more pleased. Love the Butler GMT watch. The Rolex is retiring from the cockpit. Dear Butler Watch Co., I'm writing to you in response to my purchase of your watch. After 6 months of use I thought it appropriate to write a short testimonial. From the moment I opened the box and pulled out the rugged case I knew this watch was special. The design and precision of the device is world class. The band is beautiful, thick leather, stiching straight, evenly spaced and looks as good as it did day one. More importantly the time piece is impeccable with its core function which is time keeping! The Butler Watch is a nice addition to my collection, and holds it own along side watches that cost 10x. Well done and thank you for a great time piece and a excellent conversation starter! The watch came today. It is beautiful and everything you advertised. Anyway I am glad I chose Butler. The packaging is just an engineering marvel. I read the instructions once. Got it all set up and am wearing it. Often things look so good on the internet only to disappoint when one receives the item. Not so with this product. I just found it on the doorstep and it's awesome. I'll take it to Sydney with me tomorrow and show it off! 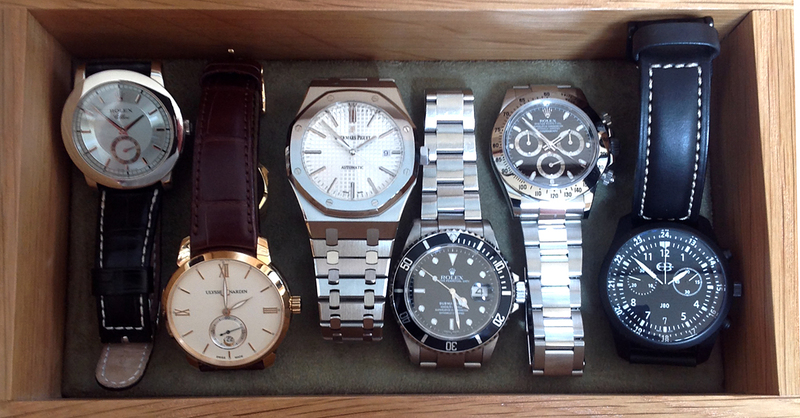 Its interesting how things come about…I look at hundreds of watches a year, don’t like most. When I saw yours, I liked the size (diameter, and the thickness of the case, both are important), the black dial with the white hands (I can read it without my glasses…), the leather band with white stitching, and the overall masculine look of the watch. I immediately loved it. I got the watch, it is awesome! Love the watch, nice job! I am enjoying my watch, getting lots of comments on it. My brother is wearing and liking his also. I bought the GMT. I really like a bit larger face on a watch and it looks great on my small wrist. The watches are absolutely spectacular!! 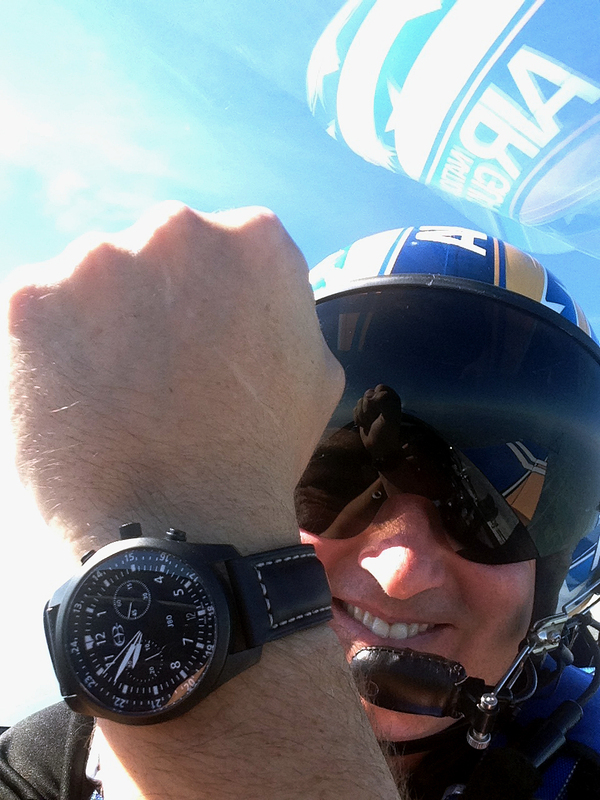 I love the watch because the face looks like a flight instrument!! I also like the serial numbers you use, Awesome!! I got my J80 on...makes me look taller!! Awesome case. Got the watch this afternoon. Very, very nice. I like it a lot. I just received the watch. It's fantastic! Just what I was looking for. The overall look, size, and feel are perfect. I just received the watch that I ordered and it is gorgeous. Thank you for your interest in what our customers are saying. We would like to hear from all of our customers and learn about their watch stories. Please send us a testimonial and feel free to include a picture of yourself and your watch, if you would like to have it posted here.